UPDATE: The CGL Conageddon2 Charity Auction is now closed, and we will announce the grand total to be donated to CURE Childhood Cancer in mid-April! Thank you again to all that participated and kindly donated to the cause! CGL is proud to partner again with our friends at Conageddon to present the 2019 Cancer Gets Lost Conageddon2 Charity Auction, online & open from March 12 – 20 for fans around the world! 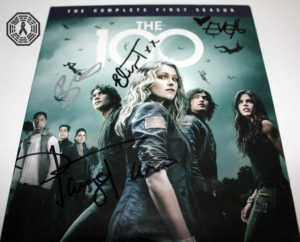 Featuring all The 100 items, many kindly signed by the cast, every cent raised in this auction will be donated to the children’s cancer charity CURE Childhood Cancer. #BidForTheKids! The CGL online auction is now open for you to start registering and bidding, and will remain open until 8:15am on March 20! Please click HERE to create an account on our external hosting site 32Auctions, and/or to log in and start bidding on auction items! Pre and post auction instructions are below. There are 56 items in the auction total; make sure you scroll down and click the arrow to page 2, to view all! If you’d like to participate in the CGL Conageddon2 Charity Auction, you need to please register on our auction hosting site, 32Auctions. It is FREE, fast and easy to create a new account and be eligible to bid in the CGL auction. Click on our auction link above, and then click on the green View All Items button on the left side. In the yellow bar that appears atop the page, you will then have the option to create an account or log in if you already have one. To prevent potentially fraudulent activity, CGL approves each registration individually – and we are doing so quickly. Once you register, you’ll get a response back within 6-12 hours (but usually much faster)! You will need a PayPal account if you plan to bid on and hopefully win items in our auction. 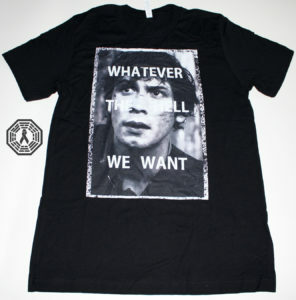 But you will also have the option of paying for items with a credit card via PayPal. If you win an item in our auction, you will need to return here to the CGL site in order to make your auction payment! There is NOT an option to pay via the 32Auctions hosting site. In the $0.00 USD or Other Amount box, it is your responsibility to input the EXACT amount owed for your total auction item win(s)! And then click Donate with PayPal if you already have an account, or Donate with a Debit or Credit Card if you do not have a PayPal account. You will have 7 DAYS to complete payment for any items won in the 2019 Cancer Gets Lost Conageddon2 Charity Auction! Once CGL has received PayPal receipts from all winning bidders and our fiscal sponsor FJC has confirmed that ALL payments have been verified (and none are fraudulent), CGL will start to ship out auction items. Please allow us 3-4 weeks for this process, and thank you in advance for your patience! All domestic packages will be shipped via USPS, and include both insurance and tracking when available. We will choose the best option for you at the most reasonable cost. Shipping notifications with tracking info will be emailed to winning bidders. All international packages will be shipped via USPS International First Class or USPS International Priority Mail. PLEASE NOTE: The winning bidder is responsible for ANY/ALL Customs and Import Duties that may apply once the CGL auction shipment arrives in your country. Please check your own country fees/duties before placing bids, and decide for yourself if you are willing and able to cover the additional fees/duties! Each individual Cancer Gets Lost charity auction item will be accompanied by a Certificate of Authenticity. 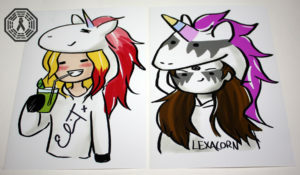 The 2019 Cancer Gets Lost Conageddon2 Charity Auction is dedicated to the memory of sweet Isla, Eliza Taylor’s young friend that recently lost her battle with cancer. We are grateful for your support of this auction, which honors her memory by supporting other children and their families that are facing this disease. I had the opportunity to host a fundraising auction with Eliza for Isla and her family a few years ago, and as a kindness to honor Isla’s legacy – I am personally covering the cost of packaging and shipping for ALL auction items (U.S. and international) in this auction. But to reiterate: the winning bidder IS responsible for ANY/ALL Customs and Import Duties that may apply once the auction shipment arrives in your country. If you win more than one item, they will be shipped together, unless one requires a poster tube or Pop box. Flat art and photos will be shipped separately. 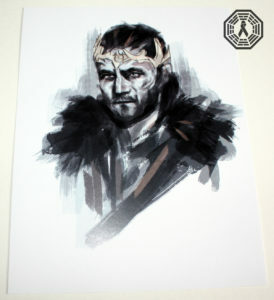 After ALL payments for items won in the 2019 Cancer Gets Lost Conageddon2 Charity Auction have been received, confirmed and processed by FJC, AND Cancer Gets Lost has completed shipment of all items – we will then donate 100% of the auction proceeds to CURE Childhood Cancer; every cent raised! We will share the total amount of money raised and donated, once that number has been finalized. Thank you so much for your support of CGL and CURE Childhood Cancer! We are so appreciative for your generosity and kindness. 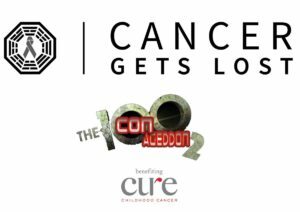 CGL is proud to partner again with our friends at Conageddon to present the Cancer Gets Lost Conageddon2 Charity Auction, online and opening in March for fans around the world! 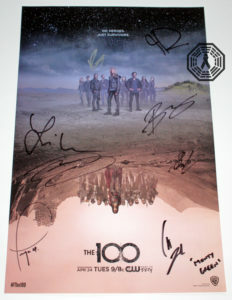 Featuring all The 100 items, most kindly signed by the cast, every cent raised in the auction will be donated to a children’s cancer charity. Open online from March 12 – 20 (before, during and after the Con in Boston), we want ALL fans around the globe to have the opportunity to support the greater good, whether or not you’re attending Conageddon! 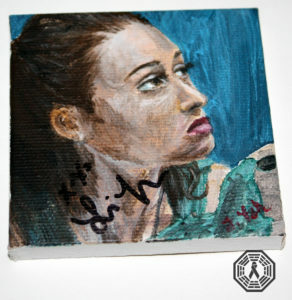 We will post a link to the online auction here, as well as on Twitter and Facebook, once it is live and open for bids! In addition, we’ll post very detailed pre and post auction instructions here. Please note: you will need a PayPal account if you plan to bid on items in our charity auction (you will also have the option of paying for items with a credit card via PayPal)! 100% of the proceeds from the CGL Conageddon Charity Auction will be donated to CURE Childhood Cancer, to benefit childhood cancer research and support the young cancer patients and their families. CURE is a terrific charity dedicated to conquering childhood cancer through funding targeted research while supporting patients and their families. 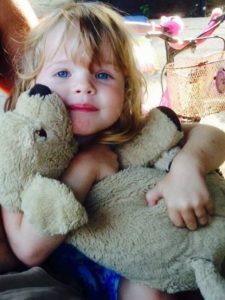 The 2019 Cancer Gets Lost Conageddon2 Online Charity Auction is dedicated to the memory of Isla, a very sweet little girl that tragically lost her battle with cancer recently. 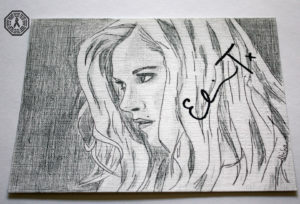 A few years ago I had the opportunity to host a charity auction to help raise money for her leukemia treatment, on behalf of her dear family friend and ours, Eliza Taylor. As most of you know, Eliza is the co-founder of non-profit Koh Tao Primary school in Thailand, stars on The 100 and is one of the primary Conageddon organizers. And now we are very honored to be able to donate every cent raised in this charity auction in Isla’s memory, and for all children battling cancer. 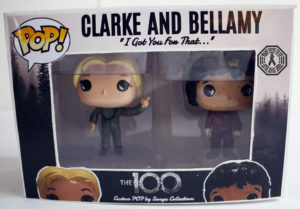 CGL is excited to be able to offer free shipping on all Conageddon charity auction item packages. Domestic and Global! Side note: I will be personally paying for all shipping and packaging out-of-pocket myself, entirely separate from CGL, as a gift and gesture to honor Isla. Thank you so much for your kind support of CGL and CURE Childhood Cancer! Stay tuned for more auction details closer to the launch date in March.